If you've been in an accident involving a large truck, it is in your best interest to consult Utah injury attorney Lynn Harris. During your consultation, attorney Lynn Harris will explain the Utah laws regarding truck accidents. 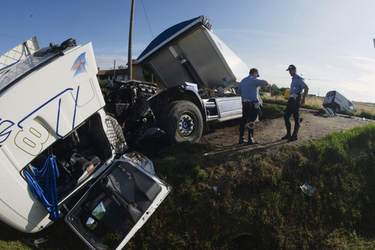 Stay at the scene of the truck accident. Exchange information with any other people who were involved. Assess any injuries or damage. Call the police if the accident caused an injury or at least $500 of property damage. Receive medical attention if there is even a minor-seeming injury. The costs of being in an accident with a large truck can be devastating, and when you've been in a truck accident, Utah car accident lawyer Lynn Harris is prepared to fight for your rights and those of your family. Whatever the circumstances of your motor vehicle accident, we're ready to hear the details and advise you about your case. If an attorney can prove that the other driver was at fault for your accident, you have a good chance of obtaining damages for your case. Contact the practice of Lynn Harris for a free consultation with an experienced attorney. No matter what happened to you or your family member, we can advise you.